This feature is not available in the Mac App Store edition of DaisyDisk. You can switch to the stand-alone version, free of charge. and enter your administrator’s password, when asked. 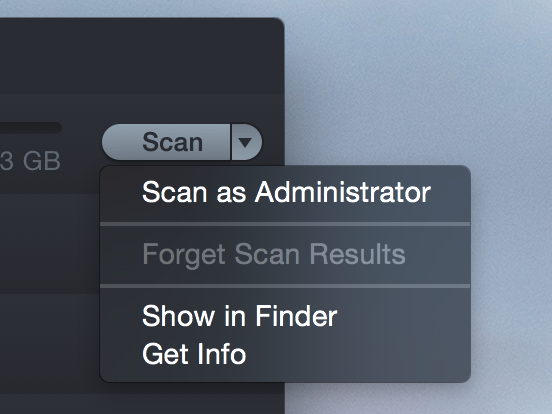 You don’t always have to scan as administrator. The normal scanning is a little faster, and is enough in most cases. Use the administrator mode when the scan results reveal significant amounts of hidden disk space. In the latter case, you can significantly save time by selecting Quick Rescan as Administrator item from the disk’s menu. Holding Option (Alt) enables full rescan. Scanning as administrator only works on local APFS and HFS+ volumes.